As Adrian was working in Pretoria for 6 months before the trip, we were able to buy the vehicle in South Africa, which changed the journey into a drive home. 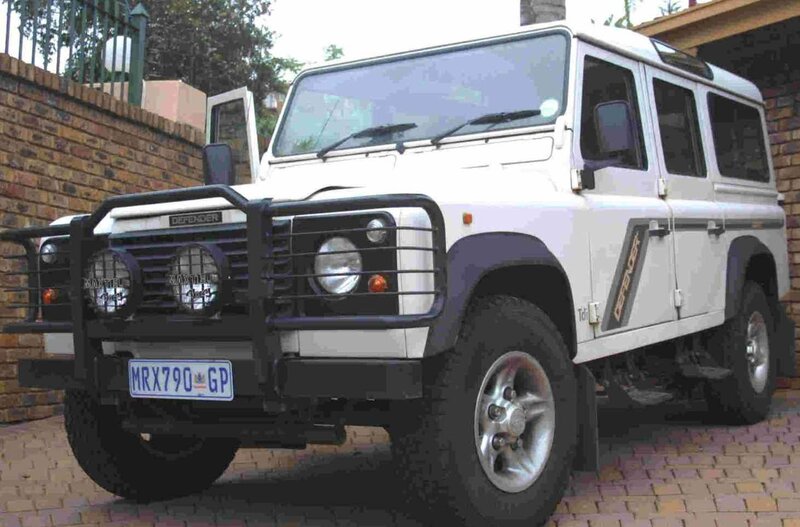 We chose a white 1998 Land Rover 110 Defender, County Tdi for the trip. She already had 90,000 kilometers on the clock when we bought her, though it appeared that she had not previously been driven off road. We named her "Daphne" after the very capable Daphne Moon character in the "Frasier" series. The original plan was to uprate the Land Rover shocks, coils and steering dampers with Old Man Emu nitro charger shocks and heavy duty coil springs. But Daphne came complete with Blistein shocks and standard springs. Following our trial run through the Kalahari, we were still undecided as to whether or not to upgrade. Old Man Emu have similar properties to the Blistein shocks but with the current high import prices Old Man Emu are no longer such an attractive option. Daphne came with alloys and tubeless Continental Conti Trac AT 285/16s. Although we ventured to the Kalahari with the original tyres, we have now had steel wheels fitted with BF Goodrich ATs (285/85/16). We will be carrying one spare wheel, on the rear swing away arm, plus a spare tyre which will be carried on the roof. Spare inner tubes and short valves will be carried, with a tyre repair kit and patches. We have 2 tyre levers and a bead breaker, which thankfully was not required on our trial run. A Bush Buddy air compressor has been fitted under the bonnet, with separate wiring into the dual battery system. We will also take a foot pump, as a back up. In addition the four road wheels have had 'Treadseal' pumped in to assist with thorns and stones. There was a protective steering bar and a bull bar already fitted. We have not had under body protection added, though a sump guard would probably be helpful. We removed the tow bar, and fitted high tensile bolts through the standard recovery points. We found it essential to protect the radiator from seeds in Botswana. A standard seed net was difficult to fit, since the vehicle had two spotlights mounted on the bull bar in front of the radiator, and we had to cut the net and then tape it round the cables. A seed net was screwed under the radiator front cover and a second net will be fitted when necessary. We had an extended fuel tank fitted so we could carry another 45 litres, giving us 125 litres in total. In addition, we will be carrying 4 metal 20 litre jerry cans. 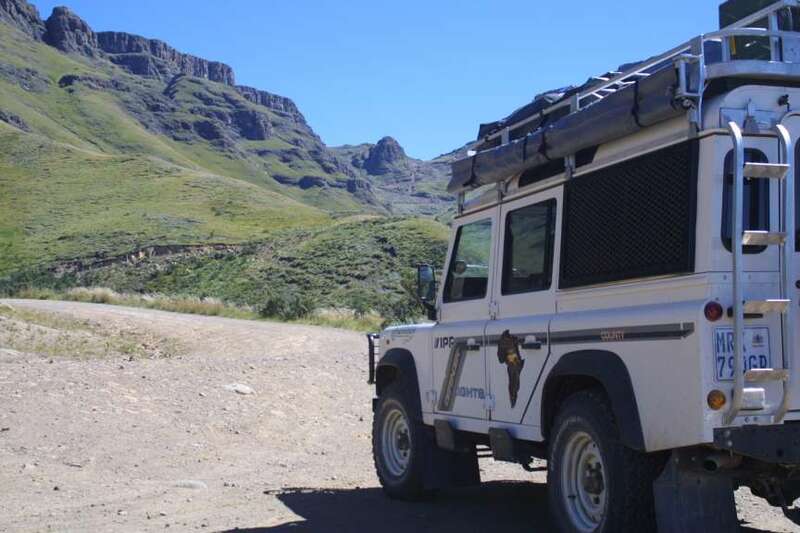 The use of plastic fuel containers appears common in South Africa, indeed the main Land Rover fuel tank is protected plastic, but the associated threat of static sparks and fire was sufficient to urge caution over the potential weight saving. Equally most South Africans carry spare fuel jerry cans on the roof, though this raises the centre of gravity of the vehicle, especially if a roof tent is fitted in addition. Tom Sheppard, in his book "Vehicle-Dependent Expedition Guide" believes water and fuel should be stored within the vehicle. Initially, we wanted to explore hanging the jerry cans over the side rear windows within a narrow side frame. However, after much discussion with Brakhah, we have decided to revert to two double jerry can baskets on the roof, with the associated weight implications. Importantly, these cans will be empty for the majority of the journey and the main tanks will be re-filled as a priority where possible. We fitted a solid roof rack with an integral self supporting awning, which was strong and well designed, eliminating the need for guy ropes and pegs. The awning was convenient even for brief lunch stops, giving instant shade. Additionally, a ground sheet has been adapted to fit around the awning, to create more shade and a shower cubicle.